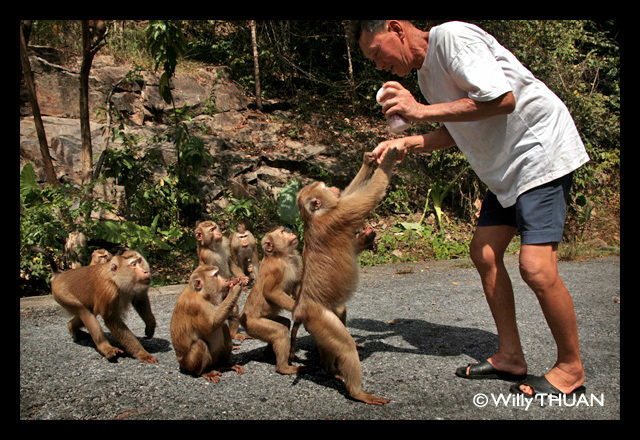 Where to See Monkeys in Phuket? 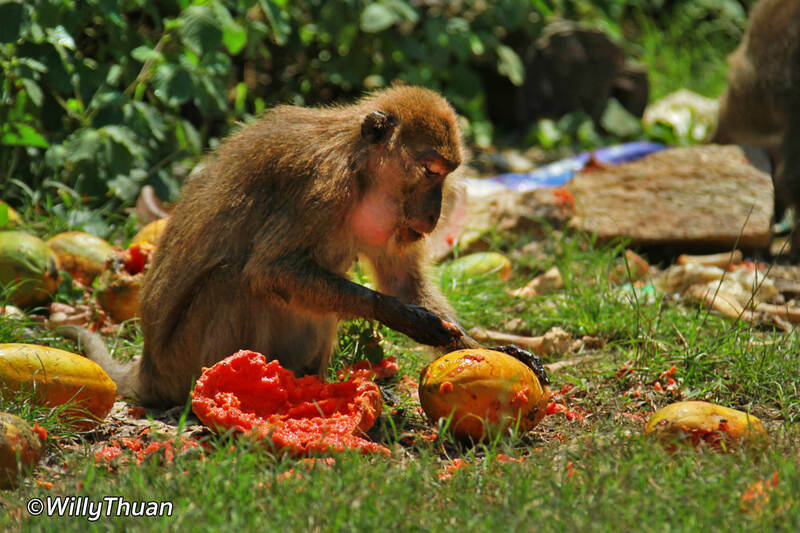 Monkey Hill Phuket is the best-known monkey playground on the island, a hill covered with red and white antennas in the back of Phuket Town. That hill maybe easy to see, but not as easy to reach: the road climbing to it is opposite of provincial hall, past the Phuket prison. It’s not a big climb and be quickly done on a motorbike. On the way up to Phuket Monkey Hill you can stop at a small Chinese shrine, not very impressive, but if you are new to Asia, everything should be interesting. Then continue further up, and they are all here, all sitting in the middle of the road, waiting for some good Samaritan to bring them some fruits or anything edible. These are not aggressive monkeys if you follow some basic rules: don’t leave anything in the basket of your bike, especially your seven eleven cookies, or worse your Vuitton bag (don’t laugh, I saw that). Babies are adorable, but if the mother feels their baby threatened, who knows how she would react. And don’t challenge that big hairy guy in the middle, he is the boss, and he’ll be happy to remind you. You can freely walk around all you want and take all the photos you like. A zoom lens will give you some great and safe shots. 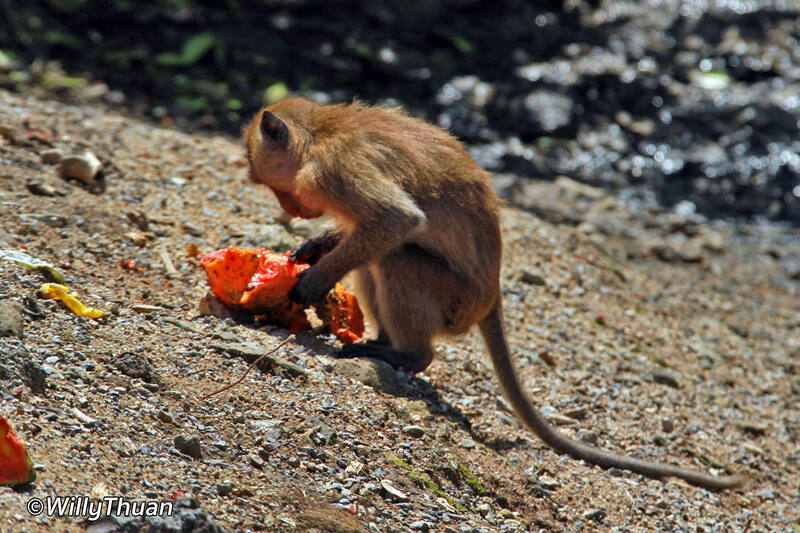 Around noon, most of the days, an old man might come in a pickup truck to distribute some fruits to the monkeys. He likes to play with the animals and is proud to show you a few tricks he taught them. I suspect he enjoys his fame with tourists as much as he enjoys feeding his little friends. 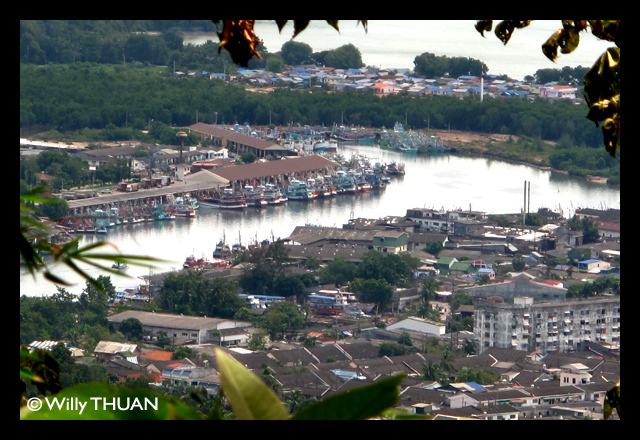 The top of Phuket Monkey Hill doesn’t offer fantastic views on Phuket, but here and there between the bushes you still can see some nice bird view. Interesting fact: if you park your car at the top, which is almost the only place passed a certain point, your car remote might not open your doors anymore! It looks like the powerful signal from the antennas interferes too much. I don’t want to know what it does to my brain. 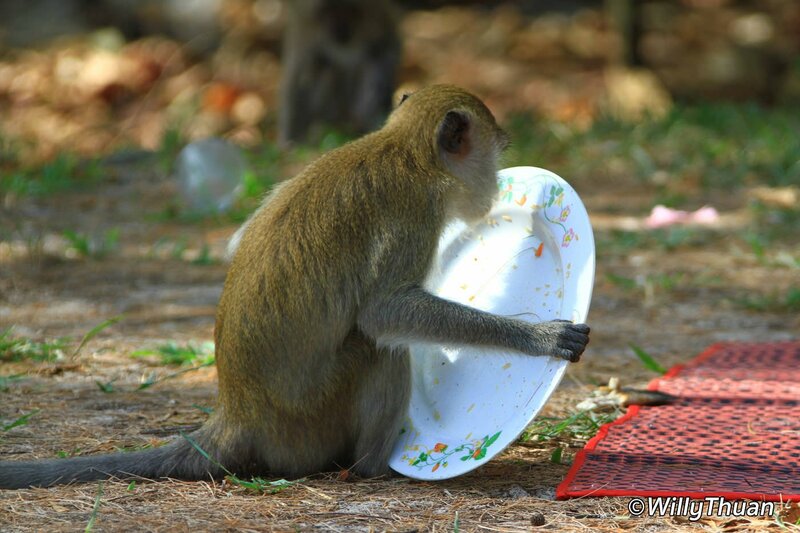 Another excellent point to see monkeys in their happy little life is even easier to find: drive to Koh Sirey, which is this not so well-known island on the east of Phuket Town. 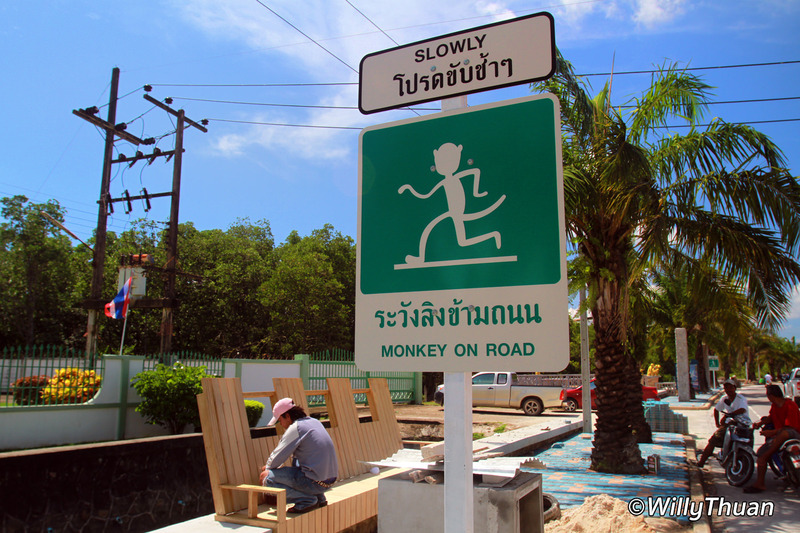 Just before reaching the island, the municipality was kind enough to place a dozen of cute green little signs on each side of the road. 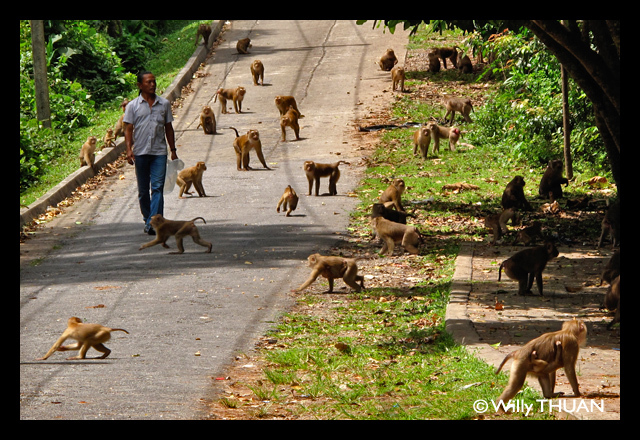 Parking is easy, and monkeys are all around. Enjoy!